Tue., June 21, 2016, 5:57 p.m. The first debate is scheduled for Sept. 26. at Wright State University in Dayton, Ohio. Washington University in St. Louis will host the second on Oct. 9, and the University of Nevada in Las Vegas the third on Oct. 19. That may not be the appraisal a republic would prefer regarding any aspect of a campaign for the highest office in the land, but Shields speaks for many who are already breathless about the presidential debates. They’ll likely pit Donald Trump, the presumptive Republican nominee, against Hillary Clinton, who has sewn up the Democratic delegate count. He has called her a “fraud” with “zero natural talent” who should be in prison. She has said he is “temperamentally unfit” with “dangerously incoherent” ideas and “not someone who should ever have the nuclear codes.” That was all in about 24 hours. They haven’t even stepped onto the same stage yet. The Ali versus Frazier-level match-ups could rival the Super Bowl and bust the presidential-debate viewership record set by Ronald Reagan and Jimmy Carter in 1980. It’d be hard to imagine that happening if one of the contenders was, say, John Kasich, instead of a former reality-TV star with an arsenal of put-Twitter-in-overdrive bon mots. There are other factors, such as Clinton’s shot at becoming the first female commander in chief and the fact that both are registering unheard-of negative favorability ratings. There’s irony in that— they’re so despised in some quarters they’re mesmerizing. “It’s just got everything going for it,” says Jim Lehrer, the former “PBS NewsHour” anchor who moderated his 12th debate in 2012. Networks including NBC and Fox have delayed debuts of some shows so as not to lose out on ratings. Marketers are scratching heads over how to monetize the affairs – they’ll run with no commercials – but entrepreneurs like Vicky Brago-Mitchell haven’t wasted time; she’s selling T-shirts with images of Trump and Clinton engaged in a boxing match, with the tagline, “The most violent fight in the world.” Dan Mueller, creator of an online debate-drinking game, is compiling a list of words to populate the 2016 version. “We’ll probably pick up some highlights from the primary debates, when Trump did real well with ‘China’ and ‘tremendous,”’ Mueller says. “We don’t want to go to crazy with it because we can get people really, really drunk.” (For the uninitiated, every time the candidate of your choice utters a selected word, you must imbibe.) Scores are typically in the range of 30 to 50 sips, or, Mueller estimates, about three beers. Calendars have been marked around the world. Tristan Averett, an American who runs a consulting firm in Lisbon, Portugal, is planning slumber parties; the debates will air at 2 a.m. in the Portuguese city. In Dayton, Ohio, Ryan Rushing will forgo a summer vacation or job so he can volunteer to help Wright State University get ready for the first one on Sept. 26. Washington University in St. Louis will host the second on Oct. 9, and the University of Nevada in Las Vegas the third on Oct. 19. Unlike primary debates, which are put on by media outlets, general election battles are organized by the Commission on Presidential Debates, a bipartisan nonprofit. They’re supposed to be cerebral affairs, with live audiences of 600 to 1,000 people who are asked to refrain from booing or shouting, and who in the past have generally complied. Any network can run them at no cost. Sept. 26 will be 56 years to the day of the first televised general election debate, between John F. Kennedy and Richard Nixon in 1960. It was watched by 66 million people in grainy black and white, and the four debates between the two drew 60 percent of U.S. households on average. Less than 40 percent tuned in for Barack Obama and Mitt Romney in 2012, Nielsen data show. To do that, he says, the commission is talking with “Facebook and Twitter and you-name-it social-media platform” to disseminate the events as widely as possible. Facebook launched a live-video streaming service last year, and Twitter has begun embedding live video into users’ timelines. The first Obama-Romney duel generated more than 10 million posts on Twitter, making it the most-tweeted U.S. political event – another record waiting to be broken. 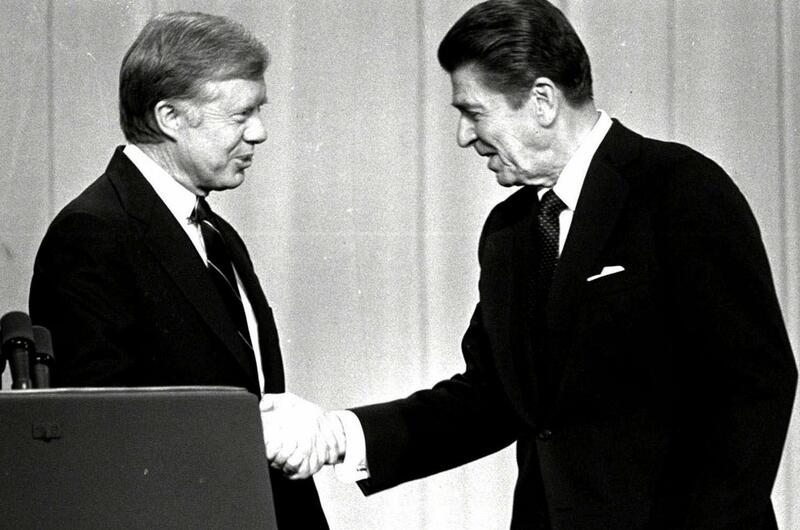 The Reagan-Carter spar pulled in 81 million viewers. For comparison, 114 million watched the 2015 Super Bowl, the biggest TV event in U.S. history. Globally, the trophy probably goes to the 2008 Beijing Olympics opening ceremony, seen by what Nielsen reckons was 2 billion people, or almost one third of the world’s population. In Mexico City, Joshua Castillo, an engineering student, says many Mexicans will be watching, fascinated as never before by U.S. presidential politics in no small part because of Trump’s proclamation that some Mexican immigrants are rapists and his promise to build a border wall paid for by their government. In Moscow, Dmitriy Kosmodemiyanskiy, a money manager at Otkritie Asset Management, says that “Russians aren’t very interested,” considering it will mean getting up at 4 a.m. Published: June 21, 2016, 5:57 p.m.